At 17, Claire Trevelyan, daughter of Viscount St. Ives, was expected to do nothing more than pour an elegant cup of tea, sew a fine seam, and catch a rich husband. Unfortunately, Claire’s talents lie not in the ballroom, but in the chemistry lab, where things have a regrettable habit of blowing up. When her father gambles the estate on the combustion engine and loses, Claire finds herself down and out on the mean streets of London. But being a young woman of resources and intellect, she turns fortune on its head. It’s not long before a new leader rises in the underworld, known only as the Lady of Devices . . . When she meets Andrew Malvern, a member of the Royal Society of Engineers, she realizes her talents may encompass more than the invention of explosive devices. They may help her realize her dreams and his . . . if they can both stay alive long enough to see that sometimes the closest friendships can trigger the greatest betrayals . . . I want to write something positive about this one, but the truth is I found it underwhelming. I was expecting a fun and exciting romp in Victorian England, charming and witty but this was neither. 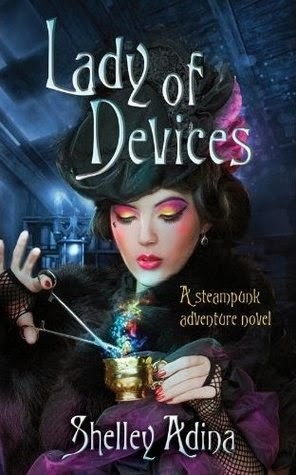 The premise, the steampunk elements, and the fact that this series has been popping up on my radar for quite some time convinced me to finally give it a chance [and you know I don’t miss a good Kindle deal – the first book of the series is indeed free]. Perhaps my expectation was a bit too high, so I’ll say this was still a cute little novel that was entertaining in parts and made an interesting attempt at world-building. But, even though, this was highly reminiscent of Gail Carriger’s novels, at the end it was not. Set in alternative Victoria England, the novel follows the adventures of the young Lady Claire Trevelyan, daughter of the late Viscount St. Ives. In the aftermath of her father’s bad investment choices, Claire, finds herself in a bind. So what’s a young Lady to do but pull up her sleeves and take her future, education, and finances into her own hands even though it goes against her mother’s wishes. Claire was certainly a fun and feisty heroine, outspoken and inventive. Her ingenuity and luck helped her along an interesting new pass, and her interaction and care for the East End gang was endearing. However her transformation from a free spirited wild child, curious about everything and more, to a more uptight, model of behavior was a bit odd and contradictory. Nevertheless I’m sure there is more to this developing story. Most other characters, including possible future adversary and love interest, Lord James and Andrew Malvern, had only minor scenes and still require further development. This novel leaves off on a rather abrupt note, so for those of you not favoring cliffhanger endings, I would suggest having the follow-up novel at the ready. Personally, I didn’t find Lady of Devices compelling enough to pick up the second book right away, but perhaps in due time I’d be curious to explore it further. Maybe if I had read the book instead of going with the audio book version I would not have enjoyed the story as much as I did, the narrator did inject a lot to the story in my opinion. As a non-lover for heavy romance in the first book I like just being left with the idea that the romantic notions would start developing soon instead of having some insta-love or having Claire's world reduced by the idea of love. Now that you mention it it was quiet a change from finishing school rebel to being a teacher and leader of all those kids.And I also agree that the ending would have been more likable if it had ended a little before it actually did. That's interesting, I can see how a narrator might have brought a bit more life to it. I really set out thinking I'm going to love this series, but then was just a bit underwhelmed. It needed more quirk maybe? Needed to be a bit more fun, and take itself a bit less seriously. Just not quite what I wanted from it. It made her expressions more real, like I could close my eyes and see her expressions as she talked with the children or the moment she knew it all had changed forever. I guess the narrator gave the book the movement and expressions the book just didn't convey? Yes, I definitely think that narrator can bring and even add something to the book. We'll see, I'm not crossing this series off of my list just yet. Might give it another go, I think there was definitely potential.